A rare phenomenon in Mobile Bay sends thousands of fish and crab ashore. Locals, like these in 1950, go crazy over "jubilees." (CNN) -- Doris Bishop has strolled to the beach in Point Clear, Alabama, in the predawn hours of summer every morning for decades. She goes in search of tiny eels, baby flounder and blue crabs at the water's surface. If the critters are spotted, it's the start of a "happy, jolly good time," when thousands of crab, shrimp, flounder, sting rays and other fish -- alive, but dazed and confused -- wash up on the eastern shore of Mobile Bay. It's a rare phenomenon known as a "jubilee," when the tide, winds and a lack of oxygen at the bottom of Mobile Bay force fish and sea creatures to the surface. News of a jubilee sets off bedlam along the coast. Phones ring off the hook and shouts of "Jubileeeeeeeeee!" echo through the night. 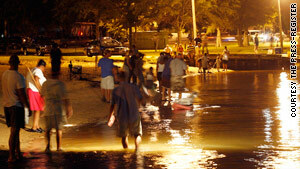 Residents rush to the beach with gigs, fishing nets and coolers. A good jubilee can fetch a summer's worth of seafood in less than an hour. 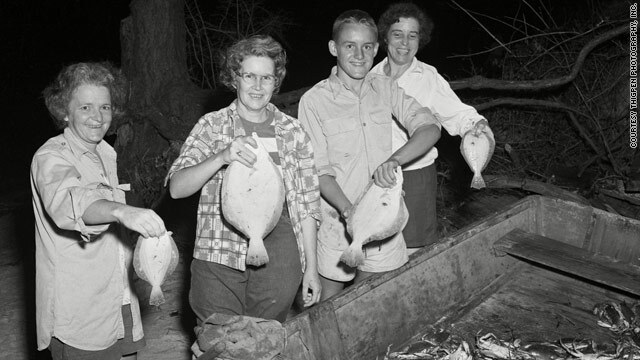 "I seen people," Doris says, "the backs of their pickups were loaded with flounder." The biggest catch she's ever witnessed was about eight years ago: A man filled his truck with more than 800 flounder. Her son stuffed a 14-foot boat with 700 flounder around 1985: "All that was sticking out of the water was maybe two inches, just a little rim of the boat." 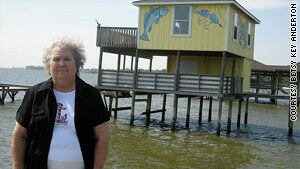 At 74, Doris is known as the Jubilee Watcher of Point Clear. Her jubilee routine begins around June 1 and goes every day through September. She wakes up shortly after midnight, walks to the beach and looks for the signs. Jubilees typically occur between 1 a.m. and 4 a.m.
With the oil slick in the Gulf, Doris and other locals are wondering the fate of jubilees. Even if the slick misses Mobile Bay, will the "jubilee" seafood be safe to eat? What will happen if the crabs, flounder, and others rise to the surface in thick black crude? "The stench of the seafood will be a horrible thing," Doris says. "Stop to think about thousands and thousands and thousands of crabs, fish, porpoises, sharks, all coming to shore dead." Doris has a unique idea on how to plug the oil well that has leaked 210,000 gallons of crude a day into the Gulf. Her plan involves BP executives. "Bunch them up and stick them in that great big hole that they're trying to stop up. Excuse my being ugly," she says in a Southern drawl as sweet as a mint julep, "but that's what I think about them." Doris has an emergency "jubilee phone list" of about 25-30 people -- relatives and friends to be notified first. But before she begins calling everyone, she grabs her gig and gets all the flounder she needs. You know, why waste time on the phone when there's fish to be had? Doris Bishop keeps watch for "jubilees" during the summer, and is usually the first to notifiy the community. If there's no sign of a jubilee, Doris washes her feet and gets back in bed before going to check again a couple hours later. Her father and grandfather --- both Bay fishermen -- instilled it in her at an early age. Jubilees are in her blood, and just about everyone's here. "Whewwww, my heavens to Betsy," she says when asked how many she's taken part in over the years. Too many to count. "It's just a happy time." Jubilees are a rare occurrence throughout the world. Fishery experts say it's not uncommon for shallow bays to have oxygen deprivation, known as "hypoxic events," for short periods of time that might bring some fish to the surface. But, they say, the combination of factors in Mobile Bay that sends thousands of fish and crustaceans to the shore all at once -- and that the critters are all alive -- is unique to the area. "At infrequent intervals in Mobile Bay, crabs, shrimp and several species of fish crowd to the shallow water where they may be easily taken by anyone on the beach," marine biologist Harold Loesch wrote in 1960 in the journal Ecology, the first in-depth study of jubilees. The phenomenon begins when a large amount of organic material on the sea floor decomposes, robbing oxygen along the bottom of the sea. That, combined with a layering of warm saltwater and freshwater from rivers pouring into the Bay, pushes the bottom-dwelling flounder, crabs, eels and others to the surface. An easterly wind and incoming tide then sends the seafood to the shore. "It's all those things coming together that leads to jubilees," says Bill Walton, an assistant professor at Auburn University's Marine Extension & Research Center. The jubilees can stretch about 15 miles on the eastern shore of Mobile Bay, from Daphne to Mullet Point. Other times, they are highly localized to a few hundred yards of shore. Last year, the state put a limit of 10 12-inch flounder per day per person. Marine biologists say if oil makes its way into the bay, then the oil itself could cause an unnatural -- and potentially catastrophic -- jubilee by eating up oxygen in the water. 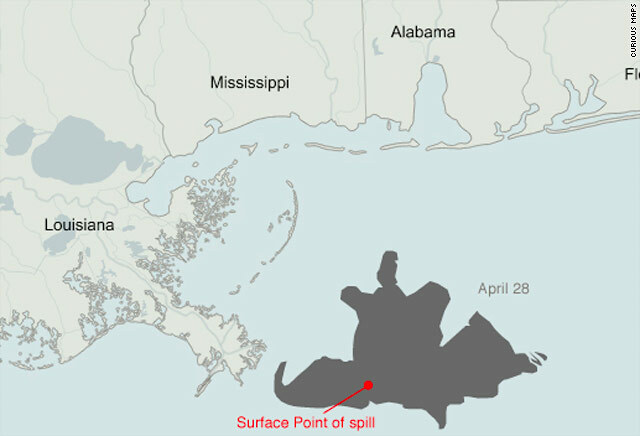 Tar balls from the spill have already washed ashore on Dauphin Island, a barrier island at the mouth of Mobile Bay. Restaurant owner Bob Pope says people "go nuts" when a jubilee is under way. "If we have crude oil on the shore," says Walton, "it potentially could kill that." Typically, there are about five jubilees per summer. Once, in the 1980s, there were seven jubilees in one week. Word of a jubilee spreads like wildfire. "Within 10 minutes, the beach is covered with people," Doris says. "I don't know where they come from. They come outta the woodwork, I think." By sunrise, photosynthesis occurs and oxygen levels return to normal. The crabs, flounder and other fish that aren't scooped up by locals scoot back out to sea. There are few good photos of jubilees -- most of them decades old and hung in local restaurants -- adding to its aura. Out-of-towners roll their eyes when locals describe the phenomenon. They think: complete folklore. That was the case when a group of tourists came into the Yardarm Restaurant in Fairhope several years ago. Bob Pope told them all about jubilees; they dismissed him as a nut. That night, a jubilee occurred outside their beach-side hotel. The next day, the group returned: "Hey, man, this really happens!" "It's just one of those crazy, phenomenal deals, and people just really go crazy over it," says Pope. "They go nuts!" In nearby Orange Beach, boat captain Philip Taylor understands people's skepticism. But nothing makes his suntanned face crack like telling tourists about jubilees. "Until you see that thousands and thousands of fish or crabs, it's unbelievable," he says. Oral histories have it that jubilees existed as far back as man has lived in the region. According to her grandfather, Doris says, jubilees were originally called "rushes," as in the fish are rushing to the shore. "Most people don't know that," she says with pride. To those who might be appalled at the thought of fish and crab being scooped up en masse, fishery experts say jubilees don't pose a major ecological risk to the seafood, and the populations are able to rebound. Doris is more direct: "I'd say to them, you're just jealous because you didn't get in on it. It's free food!" In a few weeks, she'll start her annual routine. She just doesn't know what to expect.